Good-pills.com is an online store for medication needs which has a wide range of brand and generic, prescription and OTC products available. It also goes by the name “Trust Pharmacy”, which, frankly, is a name that a lot of other online pharmacies have as well. The store has the seals of CIPA Rx, and MIPA, which are Canadian pharmacy associations, implying that the shop’s license may be from Canada or that it may be functioning out of the country. It is uncharacteristic, though, that the shop mentions one “Canadian Pharmacy Ltd”, which may mean that Good Pills or Trust Pharmacy is just another website affiliate of this “Canadian Pharmacy Ltd” company. There are no hints at the shop’s start of service, but somewhere in the site, it was stated that the store obtained its license in 2016, so we can say that the shop may have started its operations during the mentioned year. Good-pills.com claims that since its inception, it has already served a million consumers and also asserts that it has the lowest prices for the products all over the web. As for the product offering of the store, the meds are arranged by medical condition, so the consumers are able to browse the items in the shop using the categories for the medicines available in the shop. However, the store also listed the products by beginning letter and the store also offers a search function for the buyers, which gives flexible ways for the buyers to search for their products on Good-pills.com. Good Pills/Trust Pharmacy offers meds for erectile dysfunction, allergies, depression, diabetes, hair loss, pain relief, asthma, and several other medical conditions, but the shop’s best sellers include Propecia, Amoxil, Prednisone, and of course, generic and brand-name erectile dysfunction products. Good Pills offer generic Viagra for as low as $0.27 per pill, generic Cialis for as low as $0.68 per pill, and generic Levitra for as low as $1.00 per pill. These meds, including the others available on Good-pills.com, are approved by the FDA and can be purchased even without prescriptions. Prescription meds sold on Good-pills.com can also be purchased even without Rx. However, patients should never order meds which are still not cleared for their medical condition, so the patients may remain safe even while taking meds from Good Pills. Concerning shipping, Good-pills.com charges a fee of $9.95 for the airmail shipping. This shipping method takes about 3 weeks—if you want a faster option, you can have your order shipped via EMS or Express shipping, which costs higher than the regular option. In case your orders do not arrive after some time, buyers are just advised to contact support—there was no mention of refunds or reshipments for lost or damaged orders on Good-pills.com. You can reach the store using its phone numbers or its mail function available on its contact page. You can pay for your orders on Good Pills using your VISA and MasterCard credit cards. The consumer reviews available on Good-pills.com, though positive, are not thoroughly reliable, as these comments are only found on-site and not from reliable third-party review sites. Comments for Good Pills are all praising the shop’s service, but since these testimonials are only found on-site, they may be compromised and manipulated at some point. Besides, I believe these comments are bogus because I’ve seen them recurrently on the web, on several online pharmacies, and written word-for-word. In order to evaluate the domain further, I resorted to visiting several web platforms which are known to be helpful in assessing details for domains without web mentions. 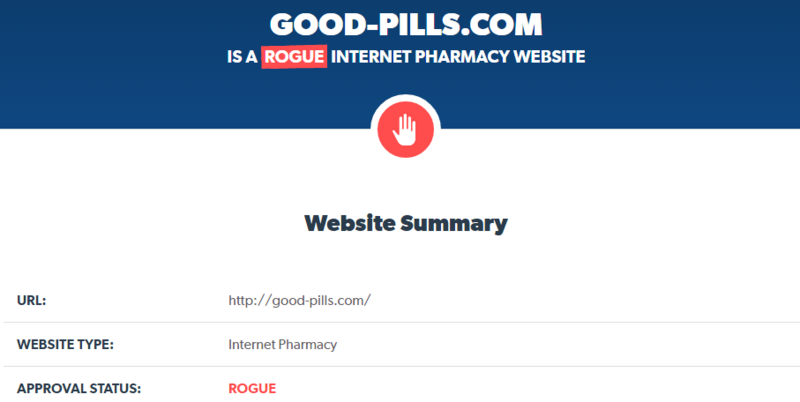 One of the platforms I used is Legit Script, and according to the result of Legit Script’s assessment for Good Pills, the domain belongs to the list of “rogue” online pharmacies on the web. Although there are no details on why the rating for Good-pills.com was bad, it is due to the issues identified for the online pharmacy. The Scam Adviser rating for Good-pills.com was also bad; the shop had a low trust rating from Scam Adviser and the shop was also detected to have a “rogue” pharmacy rating sometime in its lifespan. According to the result from Scam Adviser’s analysis, the store is only a year old and with links to several suspicious websites. The location determined for Good-pills.com is either the Netherlands or the United Kingdom. 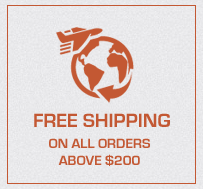 Free shipping is offered by the store for orders greater than $200. Unlike its online counterparts, though, Good Pills does not offer free pills, voucher discounts, and other deals. The store, though, has its product prices decreasing as the order amount of the buyers increase. 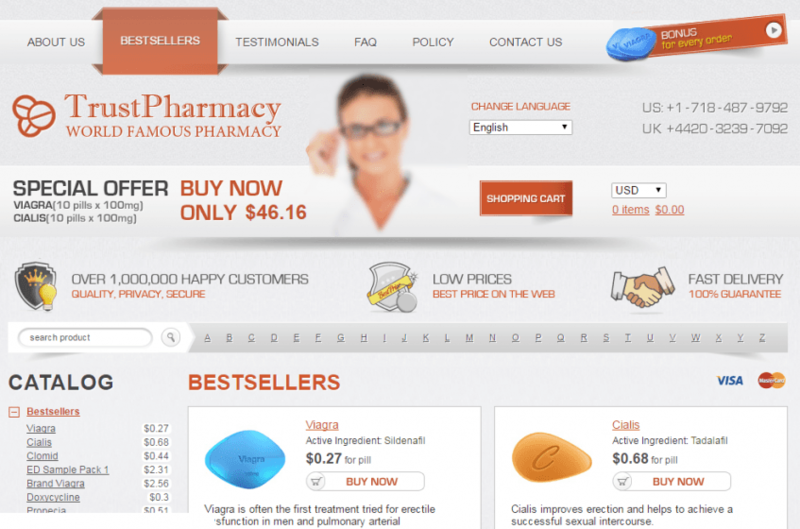 Good Pills or Trust Pharmacy is an online shop with a template I’ve seen over and over again on the web. Since this is the case, its reviews are also recurrent in other virtual drugstores, which indicate that the shop’s comments are all untrue. Prices for the products sold at Good-pills.com are low, but I can’t endorse the shop due to its lack of essential reviews from third-party sources, and also due to its fake reviews. I am awarding Good-pills.com a score of only 1 out of 5.